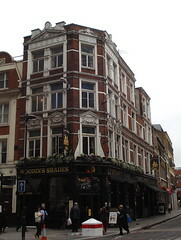 Nicholson's pub near Liverpool Street. The interior is long and narrow but with a high ceiling and large windows along the long side. Still, it's relatively dim inside, perhaps because of the large black shades that overhang the pavement. The decor features lots of dark wood, and chandelier style lighting. Most of the windows are glazed with large panes of clear glass, but the side door is flanked with a couple of panes of dimpled glass with simple stained glass detail, mirrored in the privacy screens to either side. There's more stained glass above the corner entrance, with an ornate rendition of the pub's name photo. Old photos of Bishopsgate and Petticoat Lane hang on the walls, along with a rather small reproduction of an 1851 map of London. Condiments sit on an old-fashioned sideboard at the end of the bar. A silently flashing fruit machine is wedged in by the side door, and two flatscreens are mounted near the ceiling. There are six handpumps on the bar, which on our September 2014 visit were offering Sharps Doom Bar, Stewart Dakota, Black Sheep Bitter, St Austell Tribute, Exmoor Ale, By The Horns The Saint, and Moles Mole Catcher. Beers/lagers on keg fonts included Blue Moon, Outlier Blonde, and Peroni. A glass of lime and soda (more than a half, less than a pint) was 60p. Kake visited on a Sunday morning in September 2014. There were quite a few people in at 11:15am, including two parties of four having a late breakfast. The flatscreens were showing the news with the sound off, and music was playing, not too loud. According to the 2015 Good Beer Guide, food is served until 10pm every day. This comes from a chain-wide menu photo of the Sunday menu as of September 2014. Accessibility: A step to get in. Most of the ground-floor seating is at high tables, though there are some normal-height tables toward the back. Toilets are down a flight of stairs with fairly tight bends and a continuous handrail on one side. Last visited by Kake, September 2014. Opening hours taken from the 2015 Good Beer Guide. Last edited 2015-09-12 14:14:03 (version 2; diff). List all versions. Page last edited 2015-09-12 14:14:03 (version 2).